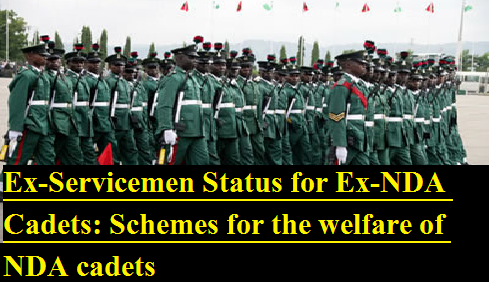 NDA cadets who are medically boarded out are not being granted Ex-servicemen (ESM) status as the NDA cadets are not yet commissioned as officers and are therefore not counted as “Servicemen”. Ex-gratia amount - Rs. 3,500/- p.m.
Ex-gratia disability award – Rs. 6,300/- p.m. (100% disability). Constant Attendance Allowance – Rs. 3,000/- p.m. (100% disability as recommended in invaliding medical board). Disability:- Rs. 7.5 Lakhs for 100 percent disability proportionately reduced to Rs.1.5 lakhs for 20 % disability. Ex-gratia Grant:- Rs. 50,000/- per cadet being invalided out with less than 20% of disability in the first two years of training and Rs. 1 lakh for cadets if invalided out with less than 20% of disability during the last year of training. Preference in Employment in the Government Jobs: Cadets who are invalidated out on medical grounds attributable to military training are accorded Priority-1 for the purpose of employment in Government service. The cadet consequent to his injury is provided free medical treatment in Military Hospital, Command Hospital and Research & Referral Hospital, Delhi. The cadet is only invalidated out in the medical board if he does not recover from the injury and is found unfit for further military training with the aforesaid treatment. The data on expenditure incurred on such treatment is not maintained. This information was given by Minister of State for Defence Dr. Subhash Bhamre in a written reply to Shri Parimal Nathwani in Rajya Sabha today.